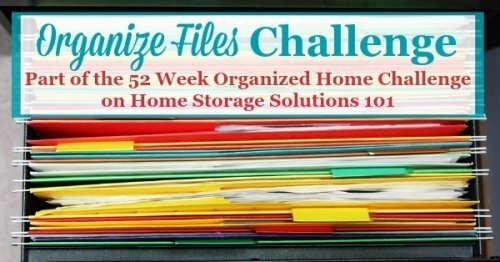 In this week's challenge we'll tackle how to organize files in your home so you can find the paper and documents you need, when you need them, without having to spend all your time filing. This challenge is really a culmination of several week's worth of work you've already done, if you've been following along with the past several challenges. That is because creating a home filing system all at once can be a bit daunting, so I broke down the process over a couple of week period. First, we organized how we dealt with and processed much of the incoming paper into our homes, with our home mail organizer center. Next, we dealt with organizing the paperwork that goes out most frequently in our homes, organizing and paying bills. Then, lastly, we worked on organizing one type of document that was needed each year, tax documents. Are you new here? 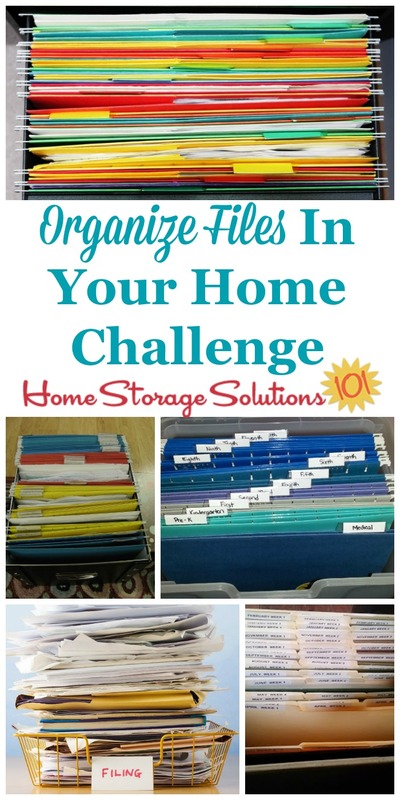 The Organize Files Challenge is part of the 52 Weeks To An Organized Home Challenge. (Click the link to learn how to join us for free for future and past challenges if you aren't already a regular reader). Now, we'll put all those previous actions in their place, and finish off a large majority of the paper organization, by creating a home filing system that saves additional documents you may need to reference over the years for your home to function smoothly. The first step in the Organize Files Challenge may seem like an obvious one, but it is very important, since it is to choose a place and storage solution to store your home's files. I made the mistake for several years of my adult life not really having a place to file and keep papers in my home. That resulted in lots of lost paperwork, and scrambles to find important documents when we needed them. Every home, no matter how small in size or number of family members needs a place to hold and file paperwork. This can be a file drawer or cabinet, a rolling filing basket, or a cardboard bankers box. It should ideally be at least two file drawers in size, or an equivalent based on the storage solution you choose. That may seem large to you (or small, depending on how much paper you have), but giving your paper enough space is important. 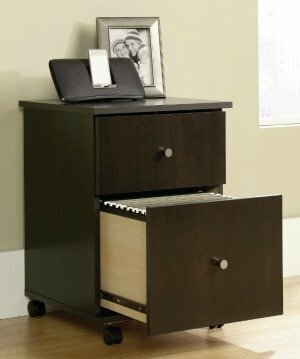 You can choose a file cabinet that looks like one you'd find in an office, or they have file cabinets for your home which look more like nice pieces of furniture. Make room for as much filing space as you need, because if you don't have enough filing space you'll delay filing things, because shoving one more thing into the space just really isn't possible. You can choose to have your files located wherever you want in your home, but ideally it will be close to your mail center, and to where you pay your bills and otherwise do your paperwork, such as in your home office or kitchen. If you've already got some type of filing system set up, even if it's not caught up and to your current liking, you will also need to deal with the contents of this current filing system during this challenge. As always, before we begin to organize we get rid of excess clutter, so step 2 of the challenge is to declutter your current filing system, getting rid of any documents that are no longer worth saving, but instead are just paper clutter now. You can read my article on how to get rid of file clutter here for more details. 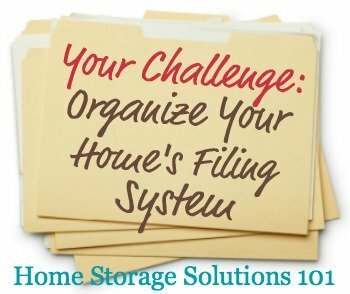 The next step in this challenge is to create your home filing system and organize the files within it. You should use a combination of hanging files and manila folders. I've provided more general filing tips, plus discuss the filing supplies you'll need in this article. The files you choose for your filing system will be somewhat unique to your individual circumstances, but here is my article listing suggested file categories for your home filing system that can help you out. One file everyone should have though is a vital records file, which contains some of the most important and hard to replace documents in it. The link provides more information to my article about how to create this file, and ways to safely store the documents contained within it, including some information about fire-resistant filing boxes and safe deposit boxes. Once you've create all your file folders go ahead and create a file index. The article linked gives you more information, but basically this is a table of contents for your filing system, which will help you not accidentally later make duplicate files with a slightly different name, or scratch your head wondering what you named a file. Next, go ahead and organize files for each of the categories, adding things as you go. If you've been working on your filing system from the very beginning of keeping your home, what I've just told you to do doesn't sound too overwhelming. However, if you've got papers all over your home and never had a home filing system before, what I just said about how to organize files will seem like an almost impossible task. Trust me, I've been there. The first thing to do is set up the system, and begin using it today. Over the next couple of weeks sit down with a shredder and go through your papers, putting them into the correct files or shredding them if you no longer need them. It will take a while, but a little at a time while listening to the radio or watching a movie on your computer will get the job done and then you'll just have to deal with papers as they come in, not huge stacks ever again! The last step in the Organize File Challenge is to have a good look at your files annually, and decide what can get tossed, so you don't start getting too much paper accumulated over time. Honestly, much of the paperwork that is unique to this challenge, like investment documents or medical records, and vital documents, all need to be kept long term so you won't actually be purging them often, if at all. However, there are less of these documents typically than the kind you can throw away in reasonable intervals, like your utility bills and grocery receipts, for example. I've given instructions for a "retention schedule" for those types of documents, and when to trash them in this article here. As long as you purge these types of documents regularly (and by that, I mean annually), you won't find yourself running out of filing space too quickly. Here's my article with more information about this annual mission to declutter files from your filing system with more details. Remember some of those documents that you purge should be shredded, not just tossed in the recycling bin or trash can. Here's my list of what documents need to be shredded so you don't accidentally disclose personal identifying information during this annual purge. I would love to know how this week's Organize Files Challenge is going. You can tell me your progress or give me more ideas for how you've organized your home filing system in the comments. I also love before and after pictures of your file drawers or boxes, and would love to see some of yours. Submit your pictures (up to four per submission) and get featured in the Creative Storage Solutions Hall of Fame. You've worked hard to get organized, so now here's your chance to show off! Plus, if you've gotten rid of lots of papers over the course of the last few challenges, make sure you share your successes in the getting rid of paper clutter hall of fame. We're working on our homes slowly, one area at a time, so don't get too distracted from the Organize Files Challenge this week. However, I want you to know that we're getting close to being done with most of our paper clutter and organization, with just a couple of areas to go. Next week we're going to work on some areas that provide a large bulk of paper clutter in our homes, when we work on organizing magazines, newspapers and catalogs.